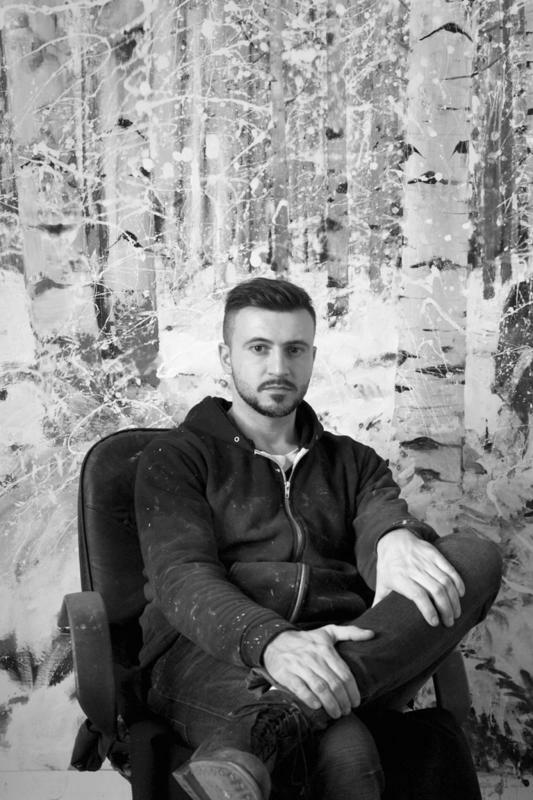 Art Market | Berlin-based Romanian artist Adrian Ghenie, has reached an international dimension in only a matter of years. Ghenie belongs to the generation that lived through Romania’s shift from a dictatorship to a freer society in 1989, after Ceausescu’s passing. Nowadays, his works have reached exceptional prices in galleries and public auctions for an artist born in 1977. We offer an analysis of the market perspectives. - Ghenie graduated at the age of 24 from the University of Art and Design in Cluj-Napoca, an important space of creation and a key driver of the current Romanian art scene. At 28, during the process of emancipation from the dictatorship, he co-founded Galería Plan B in Cluj along with artist Mihai Pop. In 2008, they opened a second cultural space devoted to artistic creation and exhibition in Berlin. - Also at the age of 28, he took part in collective exhibitions focused on the Cluj school such as Cluj Connection at the Haunch of Venison in Zurich, and later Please Drive Slowly Through Our World at the Kontainer Gallery in Los Angeles. From 2007 on, he presented his work in several European cities : at the Tim Van Laer Gallery in Antwerp, at the Galerie Judin in Berlin and at the Haunch of Venison in London. In 2011, his participation in the exhibition The World Belongs to You at the Palazzo Grassi was particularly noticed. - While 2006 was a turning point in the artist’s career, it is in 2013 he reached a higher status in the art market with a personal exhibition at Pace, a collective one at the Espace culturel Louis Vuitton which celebrated the Scènes Roumaines, and with his role as Romania’s representative at the 56th Venice Biennale. In the year 2013, all of the artist’s works presented at public auction were sold, most of the sales were above the estimates. For instance, The King (2009) and Dr. Mengele (2011) were sold by Sotheby’s London for $332,825 and $189,809, tripling their respective estimates. On October 13, 2013, Tajan sold the painting Pie fight interior 11 (2013) for $207,240 (est. $68,851 - $96,392) at the Cluj 2 sale to benefit Fabrica Pensule. These sales showed a drastic increase in prices compared to the previous year, during which prices ranged from $3,750 to $69,673. Until early 2016, there were no unsold works. Furthermore, of 22 lots, 11 doubled their estimates. 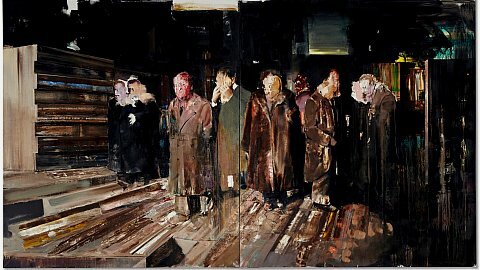 Adrian Ghenie’s first auction results above $ 1 million took place in 2014 at Sotheby’s London with the sale of The Fake Rothko (2010) for $2,439,712 ($427,569 - $598,597) and Duchamp’s Funeral I (2009) sold for $1,644,683 ($643,398 - $965,095). The following year, Adrian Ghenie’s role as Romania’s representative at the 56th Venice Biennale increased his visibility. We observe a market peak in 2016 in terms of volume and value : 41 lots are auctioned reaching a total sale of $31,874,590. Seven auction sales above $ 1 million are registered, among them the artist’s current record Nickelodeon (2008) sold at Christie’s London for $8,993,042, four times its high estimate. The growth in prices slows down slightly in 2017 : out of 35 works auctioned 9 are bought-in; among them there were highly rated pieces such as Nevada Landscape (2009) estimated between $500,000 and $700,000 or Self-Portrait as a Monkey (2010) estimated between $768,491 and $1,024,655. Of 105 sold lots, 52% doubled their estimates and 16 were above $1 million. Since 2006, there have been around twenty solo exhibitions on Adrian Ghenie’s work, most of them have taken place in galleries representing him : Nicodim, Tim Van Laer and Galerie Judin. Followed by Pace gallery since 2013, and Thaddaeus Ropac since 2015, whose involvement corresponds to a new phase in the artist’s market. In parallel, after the exhibition Adrian Ghenie at the National Museum of Contemporary Art in Bucarest in 2009, there have been 5 museum monographs held in European countries, except for Pie-Fights and Pathos exhibited at the Museum of Contemporary Art in Denver in 2012. After a succession of record sales in auction houses, Adrian Ghenie’s market challenge will be to perpetuate the artist’s position. A long term strategy would involve exhibiting in renowned museums and cultural institutions, however, his works’ current value restrains their acquisition by these establishments. The rate of unsold works in 2017 in the auction market, the evolution of the median price curve since 2013, and the speed at which the artist’s works are put on the auction market, all reveal the existence of a speculative bubble already mentioned by some gallerists in the press. In an article published by the New York Times the gallerist Mihai Nicodim refers to The Bridge, a work that he sold for $400.000 in 2015. The same piece was sold by Christie’s New York in November 2016 for $3,943,500 (est. $1,500,000 - $2,500,000). Thaddaeus Ropac also insists on the disproportionate nature of Ghenie’s current market; while Ali Subotnick, a commissioner at the Hammer Museum in Los Angeles who completed his collection in 2008 with the acquisition of two Pie Fight, describes the exceptional increase in prices as “somewhat absurd”. The artist’s situation is comparable to that of other young artists with high ratings, such as Oscar Murillo, who after a sudden speculative phase, went through a continuous decline of his work’s value on the auction market.